Geographically, Watertown is located in the central part of Jefferson County. It lies 72 miles (116 km) northeast of Syracuse and 31 miles (50 km) south of the Ontario border. The city is served by Watertown International Airport. The city claims to be the birthplace of the five and dime store and the safety pin, and is the home of Little Trees air fresheners. It manufactured the first portable steam engine. It has the longest continually operating county fair in the United States and holds the Red and Black football franchise, the oldest surviving semi-professional team in the United States. The city of Watertown was settled in 1800 by pioneers from New Hampshire, most notably Hart Massey, Henry Coffeen, and Zachariah Butterfield, part of a large migration into New York from New England after the American Revolutionary War. These pioneers chose the area due to the Black River. The pioneers' vision was for an industrial center that would draw power from the Black River. All the land was rough and unclear. Elevation was also a problem. The western end of the town was 12 to 15 feet (3.7 to 4.6 m) higher than the eastern end, with a large depression in the middle. A small stream also passed through the town. Within a few years, the center of town was cleared for the ambitious Public Square. Together with the 19th century structures that created a streetscape around it, this has been designated a historic district listed on the National Register of Historic Places. As industry and businesses flourished, residents built substantial retail buildings, churches and private residences. The Paddock Arcade, built in 1850 according to European and US models, is the oldest continuously operating enclosed mall in the United States. It is listed on the National Register of Historic Places, as are several significant churches and private mansions. The drop in the Black River at Watertown's location provided abundant water power for early industry. By the mid-19th century, entrepreneurs had built paper mills and major industries, including the first portable steam engine in 1847. In 1851, the city was joined to the state by the railroad. Other mills rapidly joined the business base and generated revenue to support early public works projects like the water system and illuminating gas works in 1853, and a telephone system in 1879. Watertown claims that Rodman native Frank W. Woolworth conceived the idea of his mercantile chain while working there in 1878. Woolworth, employed as a clerk in Moore's Store, set up a successful clearance display of low-priced items. This led to his idea of a store specializing in fixed-price, cut-rate merchandise. Woolworth left Watertown and opened his first store in Utica, New York in 1879. Among the many manufacturing businesses was the Davis Sewing Machine Company, which originated in Watertown. It was predecessor to George P. Huffman's Huffy Corporation (NYSE: HUF), now an American maker of bicycles and other sporting goods. 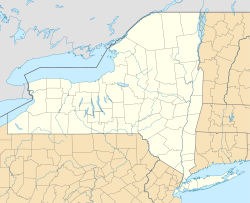 In 1805 Watertown became the county seat of Jefferson County, New York, and it was made an incorporated village in 1816. In 1869, Watertown was incorporated as a city. In 1920, the city adopted a city manager style of government. The Jefferson County Courthouse Complex is an example of the substantial architecture of the city, and is listed on the National Register of Historic Places. An early industrial city that earned great wealth for many of its citizens by the turn of the 20th century, Watertown also developed an educated professional class of doctors and lawyers. A number of factors affected Watertown's progress. The economic center of the country kept moving west, and Chicago drew off many of its younger people for business and professional opportunities. Industrial technology shifted and jobs changed. In the deindustrialization of the mid-20th century, Watertown suffered economic and population declines. The city has been working in recent decades to redevelop its downtown and revive the heart of the city. It is capitalizing on its rich architectural heritage, compact and walkable retail center, and well-designed residential areas. Today the city serves as the commercial and financial center for a large rural area. It is the major community closest to Fort Drum and the post's large population. Since the city is located just 25 miles (40 km) from the international boundary via the Thousand Islands Bridge, shopping by Canadian visitors is an important part of the local economy. Watertown, South Dakota was named in the city's honor. In addition to the Paddock Arcade and Public Square, Emerson Place, Roswell P. Flower Memorial Library, Jefferson County Courthouse Complex, Paddock Mansion, Saint Paul's Episcopal Church, Emma Flower Taylor Mansion, Thomas Memorial AME Zion Church, Trinity Episcopal Church and Parish House, and Watertown Masonic Temple are listed on the National Register of Historic Places. According to the United States Census Bureau, the city has a total area of 9.3 square miles (24 km2), of which 9.0 square miles (23 km2) is land and 0.3 square miles (0.78 km2) (3.45%) is water. The Black River flows westward through the city toward Lake Ontario. The Black River is a world-renowned kayaking destination. Competition-level kayaking events, such as the Blackwater Challenge, have been held on the river. By tradition, the city's name was derived from the abundant water power available from the river. Businesses harnessed water power to create one of the early industrial centers in New York. Paper mills were historically a major industry for the city and contributed to its 19th-century wealth. Jefferson Community College (JCC) is located in the western part of the city near the fairgrounds. Watertown has a humid continental climate (Köppen: Dfb), with cold, snowy winters and warm, wet summers. Unless otherwise noted, all figures cited below are from the GHCN station located closer to downtown. Winters can be very cold: temperatures remain at or below the freezing mark on an average 54 days annually, and fall to 0 °F (−18 °C) or below on an average 20 nights. Moreover, Watertown is located in plant hardiness zone 4b, which means that one can expect the temperature to drop below −20 °F (−28.9 °C) at least once per year. Summers are mild to warm, and temperatures of 90 °F (32 °C) or above on average occur on only 3.1 days annually. Record temperatures range from −39 °F (−39.4 °C) on December 29, 1933, up to 99 °F (37 °C) on July 20 and 27, 1894, although the airport has dropped to as low as −43 °F (−41.7 °C) on January 16, 1994. Precipitation averages 43.1 inches (1,090 mm), and is distributed fairly uniformly throughout the year, with slightly more during autumn and slightly less during spring and late winter. Since Watertown is situated near the eastern edge of Lake Ontario, it receives a bountiful amount of lake-effect snow, averaging 112 inches (280 cm) of snowfall per winter. As of the census of 2000, there were 26,705 people, 11,036 households, and 6,500 families residing in the city. The population density was 2,981.3 per square mile (1,150.8/km²). There were 12,450 housing units at an average density of 1,389.9 per square mile (536.5/km²). The racial makeup of the city was 89.13% White, 4.95% Black or African American, 0.54% Native American, 1.16% Asian, 0.11% Pacific Islander, 1.67% from other races, and 2.45% from two or more races. Hispanic or Latino of any race were 3.59% of the population. In 2009, the population was estimated at 27,489. There were 11,036 households out of which 31.9% had children under the age of 18 living with them, 40.7% were married couples living together, 14.2% had a female householder with no husband present, and 41.1% were non-families. 34.5% of all households were made up of individuals and 13.8% had someone living alone who was 65 years of age or older. The average household size was 2.32 and the average family size was 2.99. In the city, the population was spread out with 25.9% under the age of 18, 10.4% from 18 to 24, 29.6% from 25 to 44, 18.5% from 45 to 64, and 15.5% who were 65 years of age or older. The median age was 34 years. For every 100 females there were 90.5 males. For every 100 females age 18 and over, there were 86.1 males. The median income for a household in the city was $28,429, and the median income for a family was $36,115. Males had a median income of $31,068 versus $21,294 for females. The per capita income for the city was $16,354. About 14.4% of families and 19.3% of the population were below the poverty line, including 25.2% of those under age 18 and 11.8% of those age 65 or over. As of the 2010 US Census, there were 27,023 people residing in the city. The racial makeup of the village was 86.25% White, 6.04% African American, 0.58% Native American, 1.83% Asian, 0.18% Pacific Islander, 1.33% from other races, and 3.79% from two or more races. Hispanic or Latino of any race were 5.59% of the population. New York State Zoo at Thompson Park. Founded in 1920. Thompson Park. The historic Thompson Park itself is a large, city-owned public park featuring tennis courts, playgrounds, a public pool, multiple picnic areas, large open fields which host various sports and activities, an 18-hole golf course, multiple hiking trails, and many views of the city of Watertown and surrounding areas due to its very high elevation. The park was designed by John C. Olmsted, a prolific landscape architect. During the considerably snowy winters in Watertown, the park offers many large hills for sledding, as well as multiple cross-country skiing trails throughout the park and surrounding forests. Each summer, Thompson Park also hosts a firework show and live symphony orchestra show on the Fourth of July. Watertown is served by the Watertown City School District. The elementary schools are North, Ohio, Knickerbocker, Sherman and Starbuck. The higher level schools are H.T. Wiley Intermediate School, Case Middle School, Watertown High School, and Immaculate Heart Central Elementary, Intermediate, and Junior and Senior High Schools, the Catholic and secular educational institutions. There is also a Faith Fellowship Christian School. Jefferson Community College is a two-year college located in the city as well. The local newspaper, the Watertown Daily Times, is published seven days a week and serves Jefferson, St. Lawrence and Lewis counties. The Fort Drum Mountaineer is a weekly newspaper for Fort Drum soldiers and their dependents. The Watertown market is served by four commercial television stations. The oldest is Carthage-licensed, CBS-affiliated WCNY-TV (channel 7), put on the air in 1954 by the publishers of the Watertown Daily Times. The station changed its call letters to WWNY-TV in 1965. After an unsuccessful struggle against the Federal Communications Commission and its directive for newspapers to divest themselves of television stations held within the same market, the Daily Times sold WWNY-TV to United Communications Corporation of Kenosha, Wisconsin, in 1981. In 2001, United Communications entered into an agreement with Smith Broadcasting to operate a Fox network affiliate with low-power transmitters in Watertown and Massena. After a year of joint operation, UCC took complete ownership of WNYF-CD/WWNY-CD (channel 28). Watertown is also served by PBS member stations WPBS-DT/WNPI-DT (channels 16/18), NBC affiliate WVNC-LD (channel 45), which also operates the area's MyNetworkTV affiliate on its LD2 subchannel, and ABC affiliate WWTI-TV (channel 50), which also operates the area's CW affiliate through The CW Plus. Watertown was the nexus of the Rome, Watertown & Ogdensburg Railroad, which was later absorbed into the New York Central Railroad (NYC) network. Watertown sat at the junction of five different lines, as trains from Syracuse, Rome, Oswego and Utica passed through Watertown on their way to points along the St. Lawrence River and Canada. The Watertown passenger station, situated along the Black River behind Public Square at what is now J.B. Wise Place, was described as among the finest in NYC system. However, with the decline in travel by rail after World War II, passenger service to Watertown was ended in the 1950s and the station itself demolished to make room for a parking lot. Although the rail network is greatly attenuated compared to its peak in the early 20th century, CSX Transportation still transports freight by rail through Watertown. Interstate 81 runs through the Watertown area. It is a north-south route that runs from near Dandridge, Tennessee north to Hill Island, Ontario, connecting via the Thousand Islands Bridge and a short connecting road to Highway 401 across the Canada–US border. Interstate 81 passes just to the west of the city of Watertown, near Salmon Run Mall. U.S. Route 11 runs from eastern New Orleans, Louisiana, to its northern terminus at the Canada–US border in Rouses Point, New York. US 11 runs north-south through the city of Watertown. Many state highways converge on the city. New York State Route 3 is an east-west route that begins in Sterling and heads north and east to Watertown. NY 3 interchanges with I-81 at the city line. NY 3 heads east into Watertown, overlapping with both US 11 and NY 12 through downtown prior to leaving the city to the northeast to head through the Adirondacks to Plattsburgh. New York State Route 12 is a north-south route through the city, extending northward to Clayton then following the St. Lawrence Seaway to Morristown. A spur, NY 12E, takes a slightly-longer path through Cape Vincent before rejoining NY 12. New York State Route 12F is a spur connecting NY 12 in downtown Watertown to NY 180 near the Watertown International Airport in Dexter. Adirondack Trailways serves both Syracuse, to the south, and Potsdam, to the east on its U.S. Route 11 run. Fred Harvey Harrington, educator and President of the University of Wisconsin–Madison, was born in Watertown. American writer Fred Exley grew up in Watertown, and the city provides the setting for much of his 1968 novel A Fan's Notes. Watertown was the given setting for the 1990 Bette Midler film Stella. While the movie was filmed in Ontario, several local items were imported to appear in the film, including the local daily newspaper, taxi-cabs and shopping bags from the locally owned Empsall's department store. Little Trees air fresheners were invented in Watertown in 1951; now the city is home to the Car-Freshner Corporation headquarters and manufacturing plant. Harry Chapin made a famous quote—"I spent a week there one afternoon"—about Watertown. His song "A Better Place to Be" was inspired by a story he heard in Watertown. Chapin mentioned both the quote and the origin of the song on his 1976 album Greatest Stories Live. Frank Sinatra's 1970 concept album Watertown charts the story of a middle-aged man in Watertown, New York, whose wife has left him and his children. In the 2005 film Robots, the fictional town of Rivet Town is based on Watertown, where Robots director Chris Wedge lived during his teens. In the Law & Order: SVU episode "Selfish", there was a mention of Watertown and Evans Mills as a wanted man had escaped to a cabin there. The episode showed much of the surrounding area including areas North where the show chased the criminal to Canada. ^ a b c d "NOWData - NOAA Online Weather Data". National Oceanic and Atmospheric Administration. http://www.nws.noaa.gov/climate/xmacis.php?wfo=buf. Retrieved 2015-02-19. ^ United States Department of Agriculture. United States National Arboretum. USDA Plant Hardiness Zone Map [cited June 14, 2010]. ^ "Station Name: NY WATERTOWN". National Oceanic and Atmospheric Administration. ftp://ftp.ncdc.noaa.gov/pub/data/normals/1981-2010/products/station/USC00309000.normals.txt. Retrieved 2015-02-19. ^ "Station Name: NY WATERTOWN INTL AP". National Oceanic and Atmospheric Administration. ftp://ftp.ncdc.noaa.gov/pub/data/normals/1981-2010/products/station/USW00094790.normals.txt. Retrieved 2015-02-19. ^ Brauchle, Robert (October 26, 2008). "'It has an appeal to everyone'". Watertown Times. http://www.watertowndailytimes.com/article/20081026/NEWS03/310269988/-1/NEWS/+IT+HAS+AN+APPEAL+TO+EVERYONE+. ^ "Eric Anzalone". BBC. https://www.bbc.co.uk/music/artists/6eb4bf06-46a2-4ffd-afdb-9a3f9791ad60. Retrieved March 5, 2014. ^ "BEARDSLEY, Samuel, (1790 - 1860)". Biographical Directory of the United States Congress. http://bioguide.congress.gov/scripts/biodisplay.pl?index=B000281. Retrieved March 5, 2014. ^ a b Strong, Martin Charles (2004). The Great Rock Discography. Canongate U.S.. p. 158. https://books.google.com/books?id=_WoRAPJQ58sC&pg=PA158&lpg=PA158&dq=Albert+Bouchard+watertown+ny&source=bl&ots=qCzbw6_8M4&sig=gcZMi9tCG1mcM4XS56vOdLOPHUY&hl=en&sa=X&ei=u4QXU8zMBuet2QXmbw&ved=0CFgQ6AEwBQ#v=onepage&q=Albert%20Bouchard%20watertown%20ny&f=false. ^ "John Calhoun". Plainfield Public Library District. http://www.idaillinois.org/cdm/ref/collection/ppld01/id/923. Retrieved 22 September 2014. ^ "The Rocco P. Canale Education Memorial Scholarship". State University of New York Jefferson. http://www.sunyjefferson.edu/node/563. Retrieved March 5, 2014. ^ "Survivor". Smithsonian Institution. http://americanart.si.edu/collections/search/artwork/?id=3815. Retrieved March 5, 2014. ^ "Allen W. Dulles". Encyclopædia Britannica. http://www.britannica.com/EBchecked/topic/173365/Allen-W-Dulles. Retrieved March 5, 2014. ^ "John Foster Dulles always remembered Watertown roots -". Time warner Cable News. http://centralny.twcnews.com/content/news/557498/john-foster-dulles-always-remembered-watertown-roots/. Retrieved March 5, 2014. ^ "Frederick E. Exley, 63, Author Who Told of His Own Trouble". The New York Times. https://www.nytimes.com/1992/06/18/arts/frederick-e-exley-63-author-who-told-of-his-own-troubles.html. Retrieved March 5, 2014. ^ "Chapter 6: Wisconsin Governors". Encyclopedia of Wisconsin. 200 Park Ave., New York, N.Y. 10017 U.S.A.: Somerset Publishers. 1990. p. 94. ISBN 0-403-09907-1. ^ "FIELD, Moses Whelock, (1828 - 1889)". Biographical Directory of the United States Congress. http://bioguide.congress.gov/scripts/biodisplay.pl?index=F000105. Retrieved March 5, 2014. ^ "Paul Finkelman". macmillan Publishers. http://us.macmillan.com/author/paulfinkelman. Retrieved March 5, 2014. ^ "BEARDSLEY, Samuel, (1790 - 1860)". Biographical Directory of the United States Congress. http://bioguide.congress.gov/scripts/biodisplay.pl?index=F000217. Retrieved March 5, 2014. ^ Kingsbury, George Washington Kingsbury (1915). History of Dakota Territory, Volume 2. S.J. Clarke Publishing Company. p. 1360. https://books.google.com/books?id=I1Y0AQAAMAAJ&pg=PA1360&lpg=PA1360&dq=Oscar+S.+Gifford+watertown+ny&source=bl&ots=paqhR0VNln&sig=JpD8YfBtG6of3Wb5E5j9-Ff1Ibs&hl=en&sa=X&ei=5KUXU5mLEonY2AXbi4CgDQ&ved=0CEQQ6AEwAw#v=onepage&q=Oscar%20S.%20Gifford%20watertown%20ny&f=false. ^ "Overview for Richard Grieco". Turner Classic Movies. http://www.tcm.com/tcmdb/participant.jsp?spid=76684&apid=0. ^ "Robert Guinan". Art World Chicago. http://artworldchicago.com/robert-guinan/. Retrieved March 5, 2014. ^ Porter, David L. (2005). Basketball: A Biographical Dictionary. Greenwood Publishing Group. p. 188. https://books.google.com/books?id=DDO3sdV6ytsC&dq=Vic+Hanson+watertown+ny&source=gbs_navlinks_s. ^ "Presidents and Chancellors of the University of Wisconsin-Madison". wisc.edu. Archived from the original on 2013-11-07. https://www.webcitation.org/6KxB7QClF?url=http://archives.library.wisc.edu/uw-archives/chancellors/chancellors.htm. ^ "HASTINGS, Serranus Clinton, (1813 - 1893)". Biographical Directory of the United States Congress. http://bioguide.congress.gov/scripts/biodisplay.pl?index=H000330. Retrieved March 5, 2014. ^ "Mary-Margaret Humes". http://www.imdb.com/name/nm0401799/bio?ref_=nm_ov_bio_sm. Retrieved March 24, 2014. ^ "HUNGERFORD, Orville, (1790 - 1851)". Biographical Directory of the United States Congress. http://bioguide.congress.gov/scripts/biodisplay.pl?index=H000968. Retrieved March 5, 2014. ^ "BIOGRAPHIES OF THE SECRETARIES OF STATE: ROBERT LANSING". U. S. Department of State Office of the Historian. https://history.state.gov/departmenthistory/people/lansing-robert5. Retrieved March 6, 2014. ^ "Donald Lutz Stats, Video Highlights, Photo, Bio". http://cincinnati.reds.mlb.com/team/player.jsp?player_id=544371. Retrieved April 16, 2014. ^ a b c d e f "Newcomers Guide: People". Watertown Daily Times. http://www.watertowndailytimes.com/section/wdt_guide0301. Retrieved March 6, 2014. ^ "John M. McHugh Secretary of the U.S. Army". U.S. Department of the Defense. http://www.defense.gov/bios/biographydetail.aspx?. Retrieved March 6, 2014. ^ "The Fast and Furiously Lampooned". The New York Times. https://www.nytimes.com/2009/08/30/movies/30wein.html. Retrieved March 6, 2014. ^ "DENIS O'BRIEN". New York Courts. https://www.nycourts.gov/history/legal-history-new-york/luminaries-court-appeals/obrien-denis.html. Retrieved March 6, 2014. ^ "Coming Home- Recording Artist Kyle Puccia". 2001-2012 WWNY TV 7 United Communications Corp., Watertown, NY. http://www.wwnytv.com/features/craigs-to-do-list/Coming-Home--Recording-Artist-Kyle-Puccia-100518634.html?s=mp. Retrieved March 6, 2014. ^ "Watertown native Puccia acknowledges NASCAR crew chief award". Watertown Daily Times. http://www.watertowndailytimes.com/article/20121207/SPORTS01/712079945. Retrieved March 7, 2015. ^ "Virgil Ross Art" (in en). https://fineart.ha.com/artist-index/virgil-ross.s?id=500202058. ^ Metcalf, Henry Harrison and McClintock, John Norris (1886). The Granite Monthly: A New Hampshire Magazine Devoted to History, Biography, Literature, and State Progress, Volume 9. H.H. Metcalf. p. 243. https://books.google.com/books?id=07QVAAAAYAAJ&pg=PA243&dq=Charles+H.+Sawyer+watertown+ny&hl=en&sa=X&ei=hbEYU_XJLcKfrgG6yIGYDw&ved=0CC4Q6AEwAQ#v=onepage&q=Charles%20H.%20Sawyer%20watertown%20ny&f=false. ^ "Upstate New York Serial Killer Dies". AP. 11 October 2008. Archived from the original on 19 July 2011. https://web.archive.org/web/20110719062622/http://www.cnycentral.com/news/news_story.aspx?id=220323. Retrieved 24 March 2014. ^ Howe, Julia Ward; Graves, Mary Hannah (1904). Representative Women of New England (Public domain ed.). New England Historical Publishing Company. pp. 247–. https://books.google.com/books?id=BY0EAAAAYAAJ&pg=PA247. ^ "Young, Zina D. H.". Brigham Young University. http://eom.byu.edu/index.php/Young,_Zina_D._H.. Retrieved March 6, 2014. Wikivoyage has a travel guide for Watertown (New York). Wikisource has the text of an 1879 American Cyclopædia article about Watertown (city), New York. This page uses content from the English language Wikipedia. The original content was at Watertown (city), New York. The list of authors can be seen in the page history. As with this Familypedia wiki, the content of Wikipedia is available under the Creative Commons License.